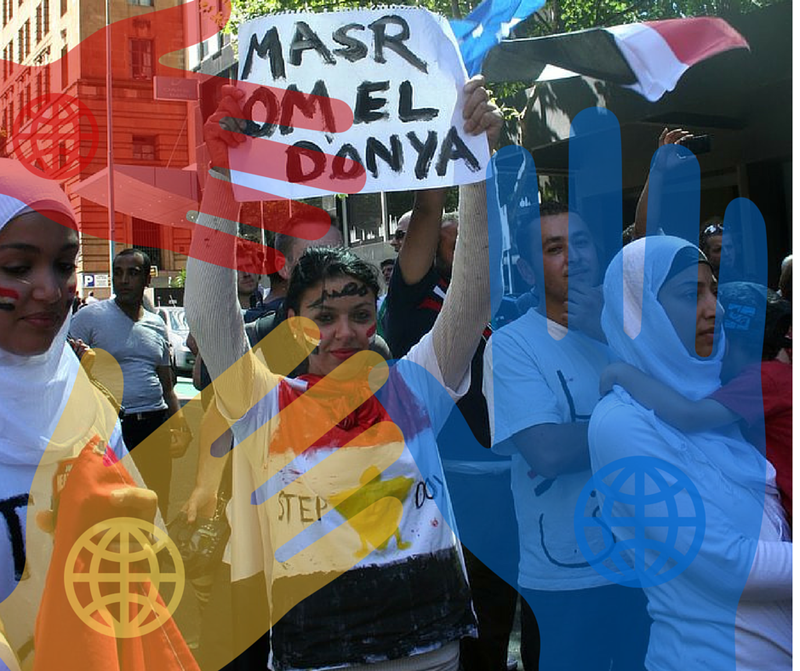 Of course “foreign hands” seek to influence Egyptian politics. The question is: are they succeeding? Yes but not always the ways they want to, suggests a series of articles in the journal Democracy. Whenever things are going wrong in Egypt, local political actors and conservative media pundits will blame it on “the invisible hands” of foreign agents–usually the US and Israel’s Zionist agenda, but sometimes Iran, and sometimes Saudi Arabia or Qatar, and every once in awhile a coalition of all of them (seriously–someone on state media offered that to account for the protests in 2011). But they are not alone, of course. Political scientists are always trying to figure out how exactly events in a country are influenced by the foreign policy of global and regional neighbors. What happens when “prodemocracy” countries and “antidemocracy” countries duke it out in someplace like, oh…Egypt? That’s the topic of a special issue of the journal Democracy entitled “Democracy Promotion and the Challenges of Illiberal Regional Powers,” edited by Nelli Babayan and Thomas Risse. The basic argument is that in addition to those countries promoting democracy–liberal powers–there are countervailing “illiberal powers” who want to see that democracy never takes root. So in this corner, we have the United States and the European Union, championing democracy, and in the other corners we have players like Russia, Saudi Arabia, and China, who are portrayed as working actively to undermine democracy. non-democratic actors can promote democratic change by unintentionally empowering liberal reform coalitions as much as democracy promoters can unwittingly enhance autocracy by stabilizing illiberal incumbent regimes. I conclude with some policy considerations. Saudi Arabian foreign policy is often declared to be countering the possible democratic transitions of the Arab Spring. As such, Saudi Arabia has been cast as a “counter-revolutionary” force in the Middle East and North Africa. This article explores the extent to which this has been the case in Egypt and Bahrain, and the extent to which Saudi foreign policy has challenged United States and European Union democracy promotion efforts in those countries. The article highlights how the transatlantic democracy promotion strategy is complicated by a conflict of interests problem, which leads them to promote democracy on an ad hoc and incremental basis. As a result, their efforts and larger strategic thinking are undermined by Saudi Arabia in Egypt. However, in Bahrain, transatlantic democracy promotion is itself muted by the strategic interest in containing Iran. As a result, Saudi Arabia can be seen as a regional countervailing power but this is implicitly in line with transatlantic policy. Tensions with Saudi foreign policy in Bahrain are over how best to manage the uprisings and maintain the status quo, rather than a conflict over political transition. And there is one article that deals broadly with the Arab Spring but focuses on Tunisia rather than Egypt. In “Local actors in the driver’s seat: Transatlantic democracy promotion under regime competition in the Arab world” authors Tina Freyburg and Solveig Richter suggest that no matter what international actors do, it is local actors who determine the effects of those influences. In studies of political transition, scholars started to explore the effect of competition between foreign policies of antipodal regimes on the political trajectories of transition countries, notably between traditional Western donors such as the European Union and the United States of America and regional authoritarian powers such as Saudi Arabia. Drawing on existing accounts, this article studies the conditions under which external actors can effectively steer local elite towards democratic reforms despite illiberal regional powers’ potential counteractions. We argue that the reform-oriented political elites in the recipient country are the ultimate judges in this competition for influence. If democracy promotion is credible, they will decide in favour of democratization, but only if the expected costs and benefits of democratic engagement resist solicitation by authoritarian powers. A study of post-Arab Spring democracy promotion in Tunisia supports the pivotal role of the external donors’ credibility in times of complex donor constellations. Freyburg, Tine and Solveig Richter. 2015. Local actors in the driver’s seat: Transatlantic democracy promotion under regime competition in the Arab world. Democracy 22(3): 496-518. Hassan, Oz. 2015. Undermining the transatlantic democracy agenda? The Arab Spring and Saudi Arabia’s counteracting democracy strategy. Democracy 22(3): 479-495.